Nominations for the 2019 Blackboard and VLE Awards are now closed. Thank you to all who nominated courses and contributed comments. The winning courses will be announced at the Awards Event on May 2nd, along with this year's new award for best VLE provision across a programme. Staff are also encouraged to nominate modules they have worked on, allowing them to share good practice with others. Thank you to all staff who put forward their courses their year. This will also be reviewed by the judges and an award for this category will be presented on May 2nd. 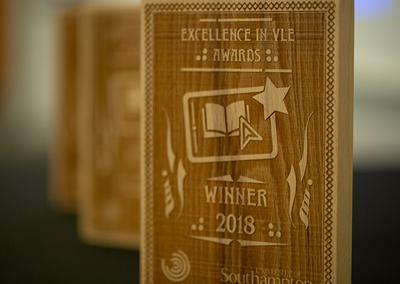 Now into its seventh year, our Excellence in VLE Awards gives students the opportunity to nominate exemplary Blackboard modules, or those using other VLE (Virtual Learning Environment) platforms, and highlight what it is that makes these courses stand out. Award-winning courses have been chosen for their innovative features and for the high standard of support they offer students. The judging panel includes student representation, Associate Deans (Education) and online learning specialists. Our course rubric explains some of the key aspects considered. Central to the VLE Awards is the chance to share good practice. Our Award winners are encouraged to contribute case studies of their practice. Short presentations summarising features praised by students, using examples from shortlisted courses, can be viewed for 2014, 2015, 2016 and 2018. Explore examples from 2017 at http://go.soton.ac.uk/vleawards. This is further explored through a series of workshops for staff, which showcase faculty-specific examples of excellent materials, offer practical tips and discuss good design for online learning. Details of the 2018 award winners are available here.